There’s been some chat in recent weeks about our kit for next season. With Watford having moved to red shorts and most of us still resplendent in black, we’ve had a mix of kits in the last few games. 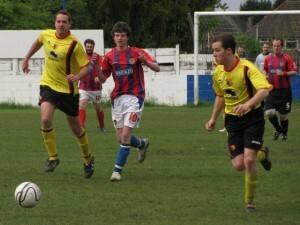 WFC have been very generous and allowed us to buy the red shorts/yellow socks we used at the London Cup Final at a cheap rate. As a result, we have decided to move to red shorts from now on. As near enough every player has yellow Watford socks, we will also stick with that for now. 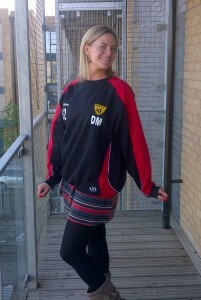 Black or red Watford socks will be fine to wear, but we would prefer you all to have yellow if at all possible. We have already sold on many of the sets of shorts and socks from the Final before the Vic Road game, but we have four sets left on a first come, first served basis. A cheeky fiver will secure a set. We are also doing another kit order for the Prostar gear. Firstly, red shorts with the WIFC badge and your Squad Number are available in waist sizes Medium (32-34″), Large (36-38″) and Extra Large (40″). If you don’t already have red Watford shorts, please ensure you order a pair now. We’re looking to place the order fairly soon, so please could all reply by Friday June 8th. Any questions, please Email Dave directly, DO NOT post below. WIFC ran out convincing winners at Parmiters School this Saturday, and head into the summer months with their biggest win of the season under their belts. 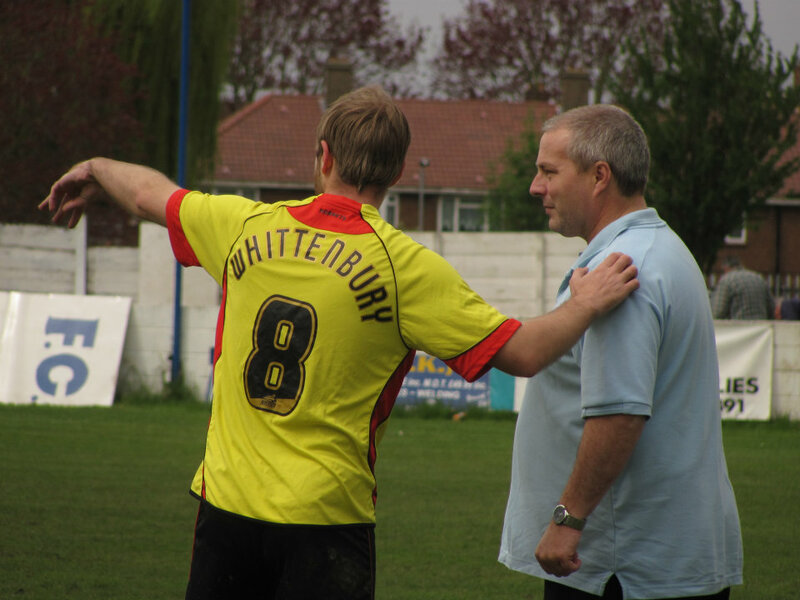 An under-strength visiting side were boosted with the loan signings of 4 WIFC players, with one of them, Paul Whittenbury opening the scoring in the first minute for the visitors. WIFC were soon on terms through Dave Soloway’s 9th goal of the season after good work from Ben Pegram and Alex Prentice, while Rob Sterry quickly added a second with a deft lob. WIFC were to remain in the ascendancy for much of the game, and Prentice’s first goal since his autumn illness extended the home side’s lead. Sterry added his second and WIFC’s 4th shortly afterwards, before Paul Withey, also on loan for the day, got a second for the visitors. 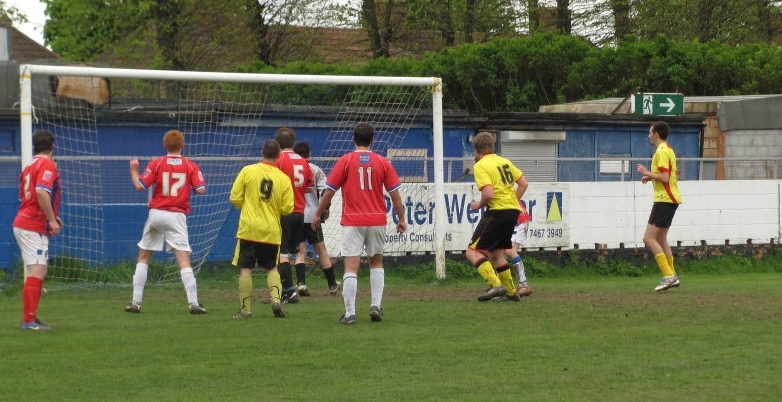 Warren Flanagan then shot home from the edge of the box before Sterry dribbled through the visitors rearguard and slotted home for his hat-trick to complete the first half scoring. 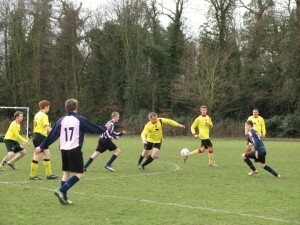 The second half continued in the same vein as the game lost shape with both sides regularly rotating their players. Leigh Harrington smashed home WIFC’s 7th from the edge of the box, and added an identical strike minutes later to make it 8. Whittenbury then added another on the break for Dulwich, before Ed Sterry’s strike cannoned off the post into the path of Matt Ainsley, who tapped in the 9th home goal. Withey then added the goal of the game with a low drive from outside the box which fizzed past home keeper Tom Beck. WIFC weren’t finished and went into double figures with a well deserved first goal for the club from Pegram, before joint managers Dave Messenger & Chris Davis went on for a cameo in the last 15 minutes, which saw Davis complete the scoring with a brace of tidy finishes following good work from the industrious Joel Moody. WIFC – Tom Beck; Jamie Parkins, Dan Willis, Aidy Spender, Matt Wells; Matt Ainsley, Ben Pegram, Rob Sterry, Warren Flanagan; Dave Soloway; Alex Prentice. Subs Leigh Harrington, Joel Moody, Ed Sterry, Dave Messenger, Chris Davis. WIFC take on the fast improving Dulwich Hamlet in a friendly match at Parmiters School this Saturday, with a 10.30 Kick-off. A recent influx of young players has seen the South London side make huge strides, so the game will be a good test as Joint Managers Chris Davis and Dave Messenger start to consider their options for Worldnet. 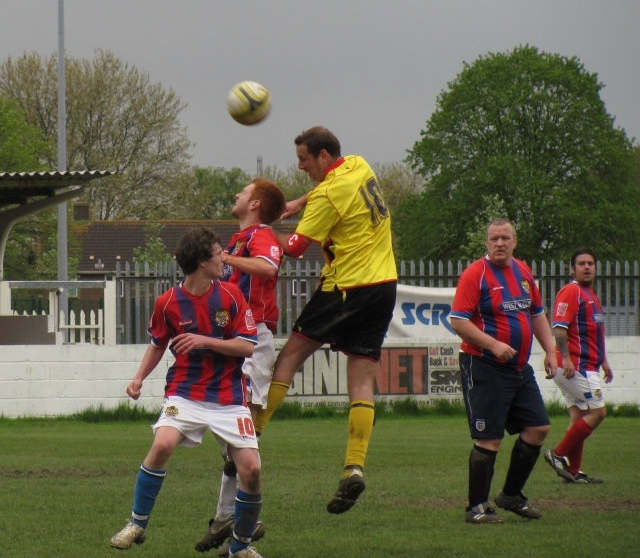 Games with Dulwich have traditionally been one-sides affairs, and WIFC’s record win was 15-2 in an IFA Cup tie played in November 2009, while on another visit in Feb 2008 Rob Sterry broke his own club record with 7 goals in the match. But the game at Belair Park earlier this season broke the mould, and Dulwich recorded their first win after overcoming a 2-0 deficit, thanks in main to a hat-trick from Ricky Laing. 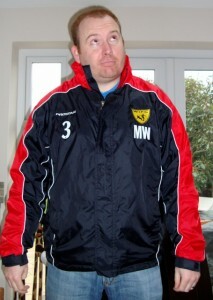 Tomorrow’s game also marks the last fixture organized by current WIFC fixtures secretary, Matt Wells. Due to the nature of the IFA, which sees clubs organize their own matches, a good fixtures secretary is vital and having taken on the role in 2009 Wells has excelled, reaching the 20 game mark every year while building and continuing excellent relationships with his counterparts across the league. Richard Walker, Tom Beck, Aidy Spender, Jamie Parkins, Matt Ainsley, Alex Prentice, Paul Whittenbury, Rob Sterry, Ed Sterry, Dave Soloway, Matt Wells, Dan Willis, Stuart Holdham, Stuart Nicholls, Ben Pegram, Warren Flanagan, Joel Moody. 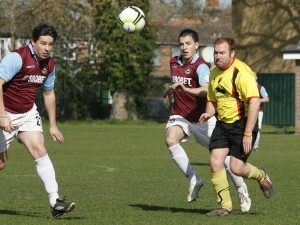 WIFC completed their IFA League season with a 3-2 win at Dagenham & Redbridge last Saturday. Having started the campaign with a 3-0 win in the reverse fixture, WIFC recorded a second double against the relative IFA newcomers, but this was by far the closest game between the two so far, reflected in the final scoreline. With the sticky Barking FC pitch playing it’s part passing football was difficult during the opening exchanges, but WIFC started to create chances, with Chris Dundon, Richard Wenham and debutant Ben Pegram all testing home keeper Steve Wilson. But it was the home side who took the lead just before the break, when Ben Jackson broke down the right and crossed for Pete Spicer, who tapped in from close range. Behind at the break, WIFC visibly raised their game early in the second half and forced a succession of corners and good saves from Wilson. Despite this, it was Dagenham who doubled their lead when Jackson took advantage of some poor defending to set up Spicer, who scrambled home and leapfrogged the creator as the Daggers top scorer for the season. 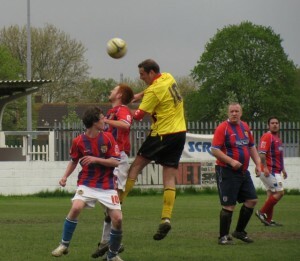 WIFC were not to be denied, and it was one-way traffic from then on as Dagenham battled hard to cling on. Wilson again denied the visitors with some smart goalkeeping, but was helpless to stop Jeremy Hinds piledriver from just inside the box, following a neat pull-back from Pegram. 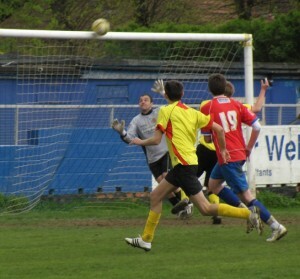 Hinds could then have drawn the visitors level when his header from a Dan Butterick cross smashed against the bar from close range. It didn’t take long for WIFC to grab the equalizer and it was Pegram to the fore once again, as another pull back was gratefully rifled home by Butterick for his first WIFC goal. Having come from two goals back to force penalties in their last outing at the London Cup final, WIFC went one better when Wenham curled home a late winner after another spell of pressure from the visitors. Jeremy Hinds (#16) Dan Butterick (#9) and Alex Prentice watch on as Richard Wenham (not in shot) curls home WIFC's late winner. WIFC joint managers Chris Davis and Dave Messenger were pleased with the win, WIFC’s 4th in their last 5 league matches of a topsy-turvy season. “It’s always nice to finish a season well, and we’ve done that in good style today. Dagenham get better every time we meet and to come from behind to win was very pleasing.” said Messenger. Joint manager Chris Davis takes in the latest Paul Whittenbury suggestions..
All eyes are now on Worldnet, which takes place in Leeds every July. The weekend long tournament is the IFA’s blue riband event, and hopes are high that WIFC can emulate last season’s run to the quarter-finals in both the main draw and the Veterans tournament, which run simultaneously. Those friendlies start this Tuesday, as two teams of WIFC players meet at Vicarage Road in the ‘Play on the Pitch’ day organized by Rob Sterry. 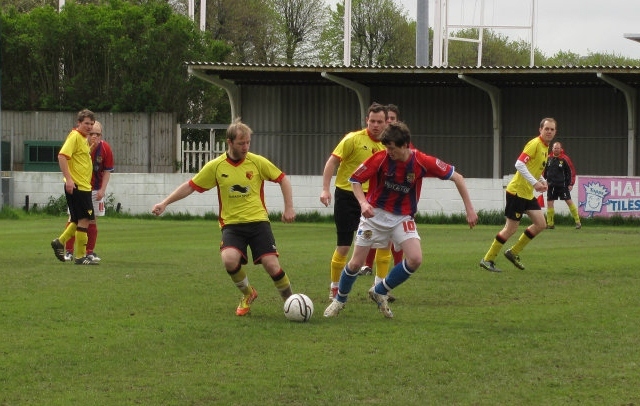 WIFC then take on Dulwich Hamlet next Saturday as preparations for Worldnet begin in earnest. WIFC – Tom Beck; Ed Sterry, Paul Whittenbury, Martin Pollard, Phil McBride; Joel Moody, Ben Pegram, Chris Dundon, Andy Myall; Richard Wenham; Alex Prentice. Subs Matt Wells, Dan Butterick, Jeremy Hinds.